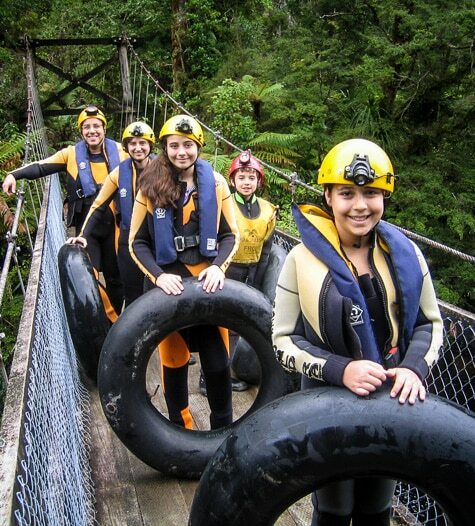 This guided family trip provides a fun, scenic, experience-packed New Zealand vacation within a two-week school-break period. When you step off the plane in Christchurch, your guide will gently remove the family-organizer hat from your head and put it firmly onto theirs—you’re here to play, too. Let them take the wheel and take care of all the details while you enjoy family time, photobombing the world’s most scenic selfies. All you’ll need to decide is whether to order the Pinot or the Chardonnay at the end of each day’s adventure. A luxury, boutique hotel on the edge of beautiful Hagley Park and a short stroll from the city’s cultural centre. A relaxing oasis amidst the city’s urban energy. 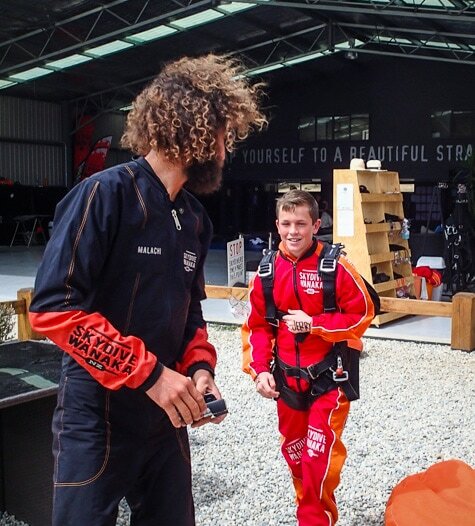 Step off the plane in Christchurch and into the care of your Black Sheep guide. 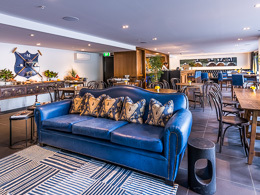 Freshen up at your hotel, then head out and explore: paddle a canoe on the Avon, stroll the Botanical Gardens, visit the Canterbury Museum, or enjoy a coffee in the square as you marvel at the post-quake ingenuity and artwork that has bloomed up in the central city. At dinner, socialize together and discuss your impending adventure. 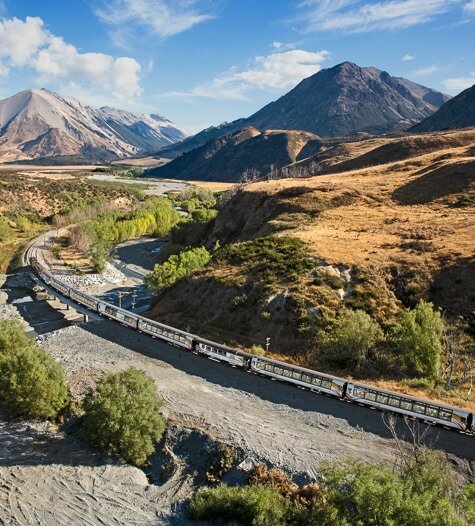 Board the renowned TranzAlpine train for a trip over the Southern Alps, crossing glacially fed rivers and winding beneath snow-capped peaks. 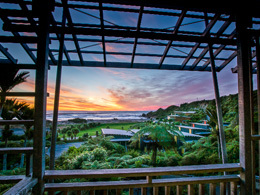 Upon reaching the Coast, rejoin your guide for a short drive along stunning coastline to our eco lodging on the edge of the Paparoa National Park. The afternoon allows you time to explore the area's features, including the blowholes and surge pools of the Pancake Rocks. This region is honeycombed with natural cave systems and today gives you the opportunity to explore one of them in a choice of two ways. Visit the cave’s dry chambers on a scenic caving tour, or stuff yourself in a wetsuit for a hilarious cave rafting adventure. Both include delicate cave formations, glowworm constellations and loads of fun. This morning, it's a spectacular drive through lush rainforest to the glacier region and a heli-hike adventure. A scenic helicopter flight carries you up the valley and over three icefalls to land on a remote, dynamic part of the Fox Glacier. 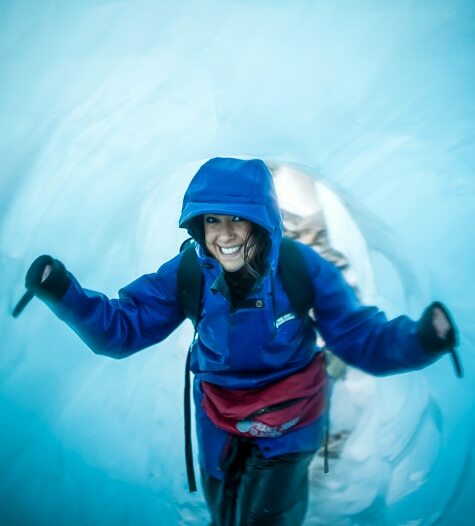 Outfitted with crampons, explore blue-ice caves, arches, azur pools and pinnacles, following ice steps cut by your guide. 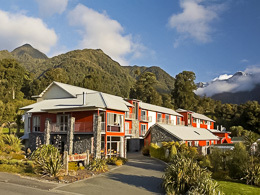 A boutique lodge in a country setting just outside Wanaka township. Stunning, uninterrupted mountain views, garden access from every room and attentive service provide a restful haven. Depart Fox and head south through the Mt Aspiring National Park to Makarora. 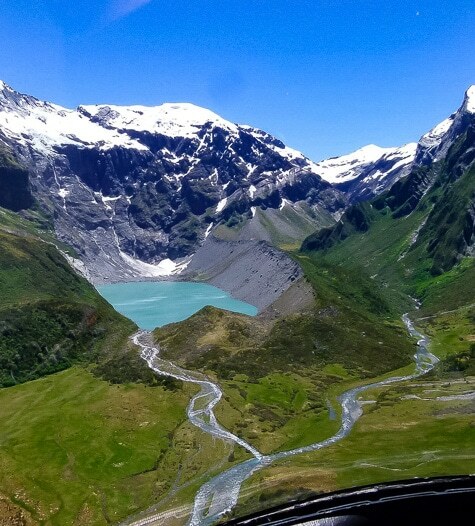 From there, a scenic heli flight takes you over the glacial lakes and mountains of the park. Land in remote Siberia Valley for a 3-hour walk through pristine alpine scenery. 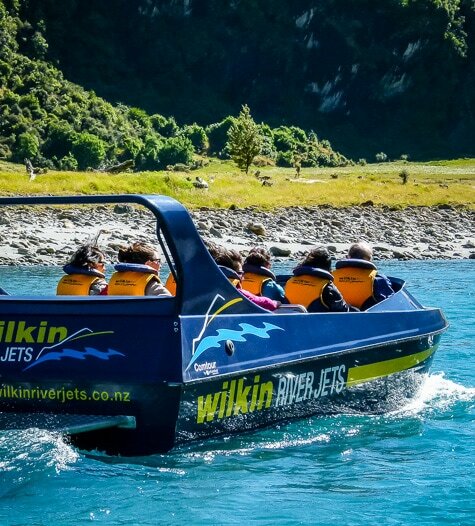 A jetboat returns you to your starting point via two wilderness rivers. Continue to the lakeside resort town of Wanaka for your two-night stay. 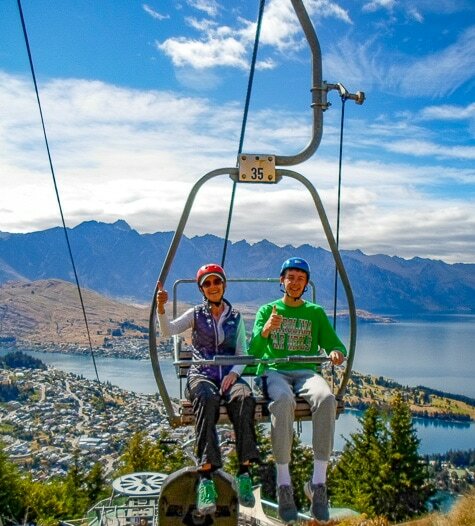 Wanaka has a huge range of activities available to make the most of the great outdoors. We’ve left the day free for you to pick and choose whatever optional activities take your fancy, from all-out adventures like sky diving and canyoning, to more laidback pursuits like cycling and wine trails. There’s also a great network of walking and hiking tracks that will fill your eyes (and phone) with some of New Zealand’s most iconic images. 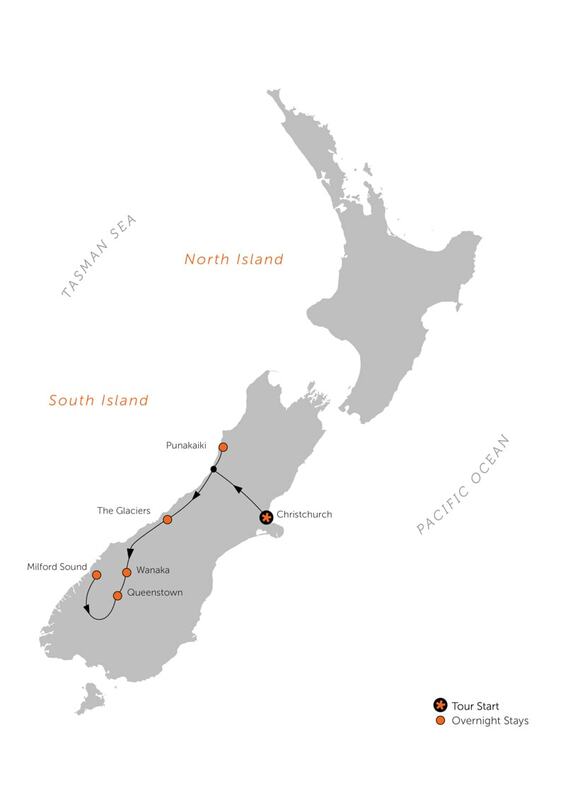 Depart Wanaka and travel by coach from Te Anau through the extraordinary landscape of Fiordland National Park to Milford Sound for your overnight adventure. 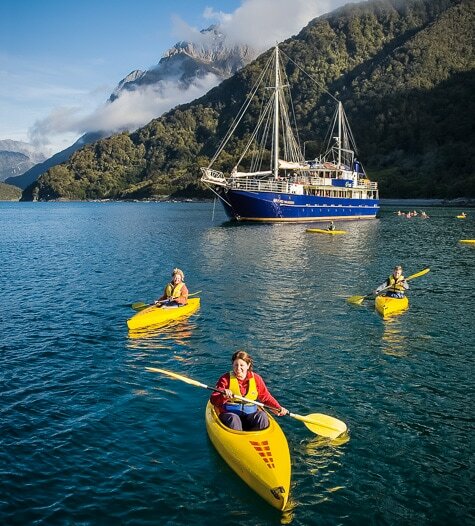 Board your vessel for your cruise, passing waterfalls spilling from vertical cliffs and fur seals basking on the rocks. Anchor in a sheltered cove and explore the shoreline via kayak or guided tender before dinner. The touring masses have long since gone home for the night, leaving you in utter tranquility. 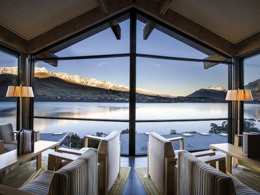 A five-star accommodation on the shore of Lake Wakatipu, with views of the aptly named Remarkable range. 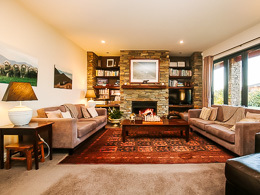 A beautifully appointed, restful retreat from the buzz of Queenstown while still within easy access to its adventures. 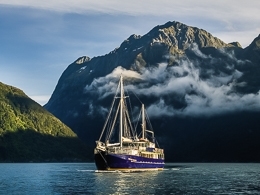 View the fiord in fresh light as you cruise back to land, rare witnesses to a Milford dawn. From Milford, your coach will carry you to Queenstown where you’ll be transferred to your hotel spectacularly placed on the edge of Lake Wakatipu and flanked by the dramatic Remarkables mountain range. Rest and enjoy the views from your balcony, or get out and explore this vibrant town. Queenstown is alive with the hum of impending adventure. Because there are so many things to do—including things you never even knew were a thing—we have left the day free to do whatever optional activities you choose. Fling yourself from a bridge (with chord attached, of course), horse trek through Lord of the Rings territory, canoe on a turqoise river to Paradise (literally)—dream it and we’ll help you do it. Tonight, gather for your farewell dinner. Depending on your flight schedule, enjoy a lakeside stroll or one last adventure before your reluctant ride to Queenstown Airport. Wonder if your Black Sheep guide will fit into your carry on. THANK YOU SO MUCH FOR ALL YOUR HELP. OUR DAUGHTERS HAD SUCH A GREAT TIME IN NEW ZEALAND, AND SO DID WE!